As 21st century consumers, we are all becoming quire energy conscious when it comes to the efficient heating of our homes balanced against the impact upon the environment around us. This is one of the primary reasons why heating oil for home use is one of the best and most trusted ways to provide us with comfort and cost savings. So, let us take a quick look at a few of the reasons why customers in Galway and indeed the West of Ireland choose our company for their heating oil needs. Thanks to modern technology, heating our homes with either kerosene or gas-derived oil offers the unmistakable benefit of lower cost per customer. This is partially due to advances in fuel technology and partially as a result of home furnaces and boilers being much more advanced than they were but a few, short years ago. The final advantage of this synergy is a greater amount of savings that can be passed directly on to the consumer. Let us not forget that domestic heating oil is one of the most common ways for homes to receive their supply of hot water. 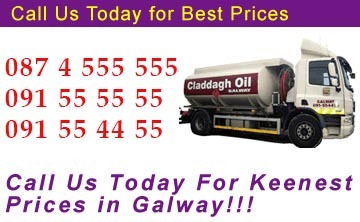 Therefore, it should come as no great surprise that our customers throughout the Galway area can enjoy delivery six days a week; often times when it will suit them the best. All of our customers and households can rest assured that quality heating oil is always close at-hand during even the harshest of winters. Thanks to the aforementioned advancements in technology, very little oil is wasted during the heating process. This will equate to less waste and a cleaner burning fuel. Obviously, such attributes will directly impact the environment around us; an essential concern for both ourselves and the future generation of Galway residents. It is also important to note that domestic oil burns at an average of 300 degrees warmer than natural gas. Therefore, less oil will be spent heating even the coldest of homes. Once again, this will allow more of this resource to be conserved while less money will be spent in the short-term. This additionally equates to an efficiency of up to 16% when compared to natural gas. Of course, it is important to note that the domestic heating oil supplied to our customers in Galway is considered to be one of the safest forms of energy in the world. There is no chance of an explosion and in fact, this oil will only burn when vapourised in the boiler or heating unit. Therefore, families can rest assured in the knowledge that their homes are being heated by the most efficient, convenient and safest means possible.